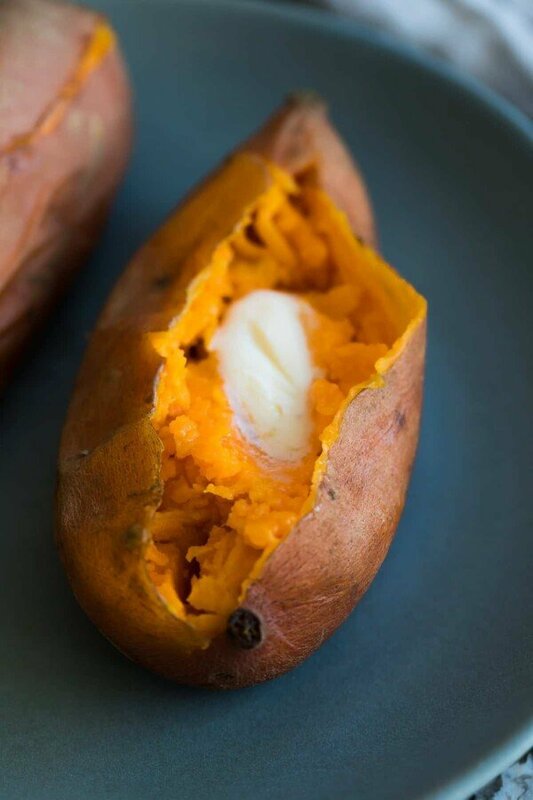 Instant Pot sweet potatoes- how to cook them to get perfect, creamy sweet potatoes in a fraction of the time it takes to roast them. Plus lots of ideas of how to use your pressure cooker sweet potatoes for meal prep! Boy oh boy has this Instant Pot sweet potatoes post been in the making for awhile. When I first bought my Instant Pot, I tried out a few sweet potatoes recipes floating around the internet, but have been nothing but disappointed. 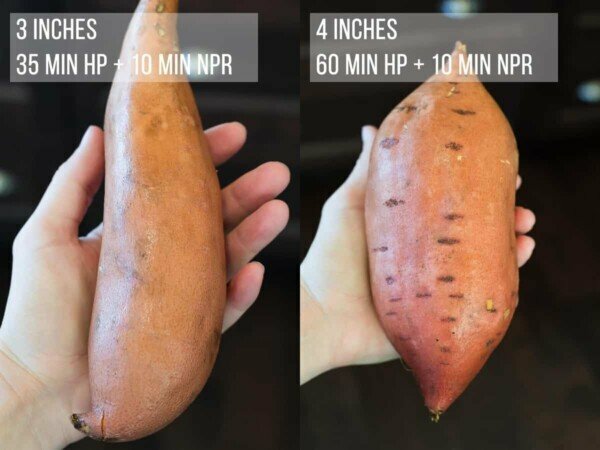 There seem to be a lot of ‘one size fits all’ recipes out there, but in my experience, the size of your sweet potatoes has a HUGE impact on cook time in the Instant Pot. So guess what, friends? I decided to test out a whole lotta different sized sweet potatoes for us and document how long each one took to cook in the IP…just so we’re not disappointed when we find our ginormous sweet potatoes did not, in fact, cook in 10 minutes. So the ‘recipe’, if you can even call it that, is just a cup of water in the bottom of your Instant Pot, plus your sweet potatoes. That’s it! 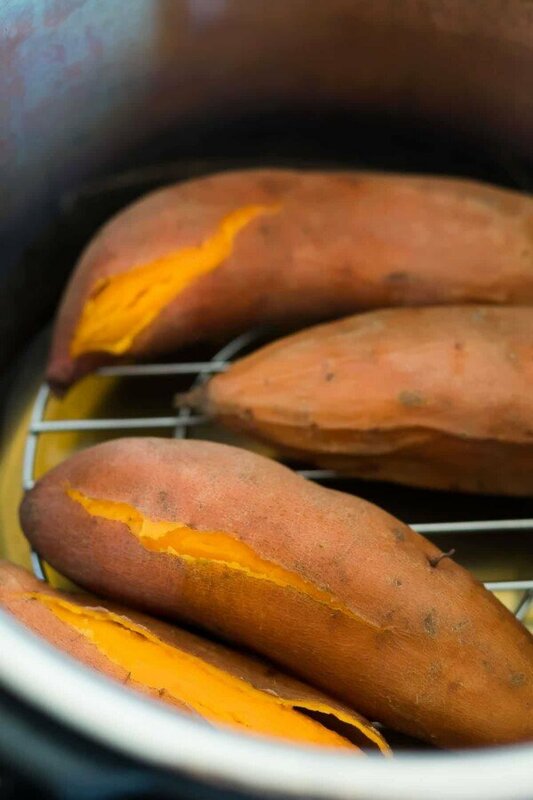 Use the trivet that comes with your Instant Pot to keep the sweet potatoes out of the water. After cooking for the appropriate time, allow the pressure to release naturally for 10 minutes. You can either leave it on ‘warm’ for 10 minutes or just unplug the pot and set a timer. Release remaining pressure and have a look at your sweet potatoes. They should be perfectly tender and cooked all the way through! If not, put them back in the IP with some fresh water and set it for 5-10 more minutes. 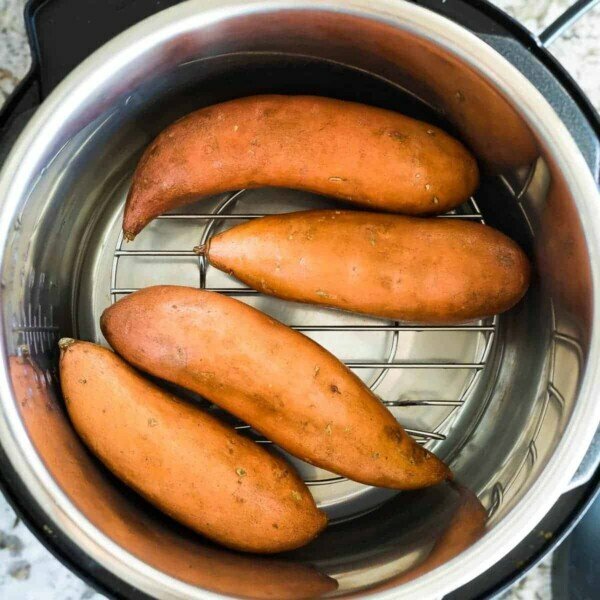 No, Instant Pot sweet potatoes do not cook ‘instantly’, however this is such a great hands-off method to cooking them and it frees up your oven for other things. And it does cook the sweet potatoes in about half the time that it takes in the oven (in my experience!). Looking for an even more hands off approach to cooking sweet potatoes? Check out these Ultra Creamy Crock Pot Sweet Potatoes! 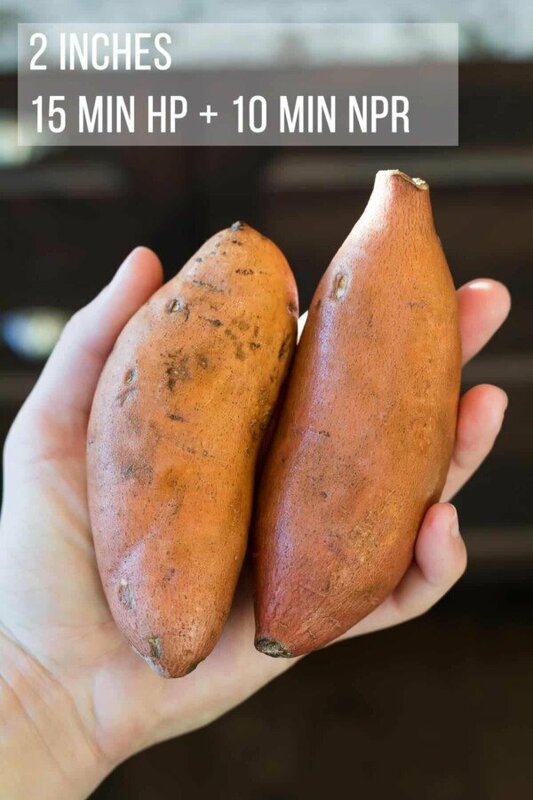 Now I love using sweet potatoes as a base in so many different recipes…so I decided to pull a bunch of easy and healthy sweet potato meal prep recipes together for some ideas of how to use these Instant Pot sweet potatoes. 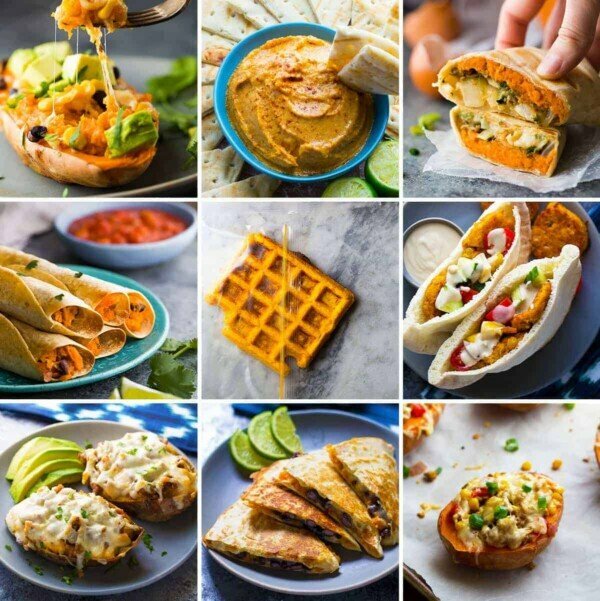 Whether you use them as twice baked sweet potatoes, in hummus, breakfast burritos, or any of the recipes, using the Instant Pot to cook them ahead definitely makes your meal prep go a little faster. Let’s check them all out! Add 1 cup of water to the base of a 6 quart Instant Pot. Add the trivet to the Instant Pot and arrange sweet potatoes. Set valve to 'sealing'. 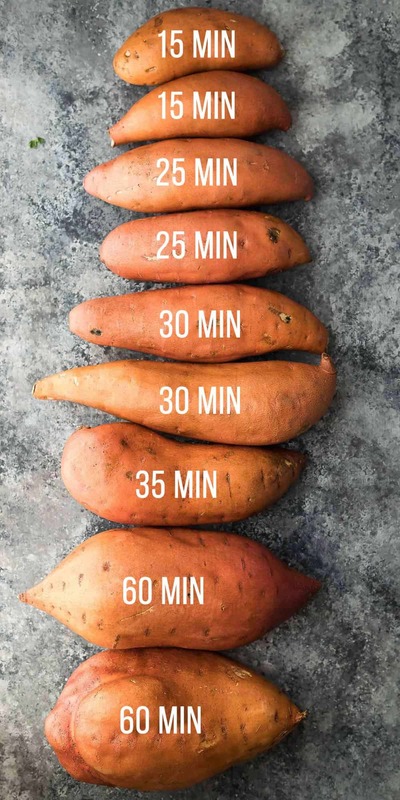 Select manual and set the timer depending on the thickness of your sweet potatoes: under 2 inches: 15 minutes, 2-3 inches: 25-35 minutes, 4 inches +: 60 minutes. When timer beeps, allow pressure to naturally release for 10 minutes before releasing the rest of the pressure. Do you know if these times work for white potatoes as well? My husband loves sweet potatoes, but I don’t like them. I was wondering if I can cook white potatoes and sweet potatoes at the same time in the pressure cooker. Thank you Denise! I appreciate you taking the time to look. I am going to try cooking both at the same time using your method. Thank you so much for the extra and very useful tips about cooking times. I love the pics showing the different sizes and specific cooking times based on times. So helpful and made my instant sweet potato experimentation tonight a hit! I’m so happy it helped! Thanks for reporting back, Melissa! 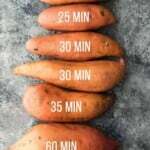 Will the sweet potato need extra time if it’s peeled and wrapped in aluminum foil? Hi Betsy! I don’t know how the sweet potato would cook unpeeled…it might need less time? I just got an instant pot and am trying to find ways to incorporate sweet potatoes into my diet (I’ve never been a fan) This post helped SOOOO much! Thank you!!! This is my go to recipe for sweet potatoes! They come out perfect every time! Can you stack sweet potatoes to cook them, or should they be in a single layer as shown? Hi Amy! It should be fine to stack them, and if you find they aren’t done, put the lid back on and add a few minutes, your Instant Pot should come to pressure really quickly 2nd time around! Hope you enjoy! Thank you for taking the time to do this. The one-size-fits-all approach definitely does not work. I appreciate all the effort that went into this, and for the list of recipes. I can’t believe it, somebody who makes sence! I read your post on making sweet potatoes in an Instant Pot. Makes total sense. I haven’t tried it yet, but I’m going to tonight. I’ll report back with results. I am sure they will turn out great!. Thank you Denise for taking the time to do the job right! LOL! I’d love to hear how they work out for you Henry! They worked out PERFECTLY Denise!!! Hi Anne! I’ve done it both ways and it doesn’t seem to matter. This is a fantastic tutorial! I’ve also tried some instructions that left me with half-cooked sweet potatoes. I bet I’ll have much better success with your tips.